An Ordinary Life : Science: Why does the sky turn red experiment! Science: Why does the sky turn red experiment! Why is the sky blue and why does the sky turn red? This is an experiment I did with my 9 year old yesterday, one we have done before but I haven't yet posted about on An Ordinary Life. It is one of those questions every child asks I think and there is a very easy experiment you can do to demonstrate why this happens. First fill a straight clear glass (a plastic cup will do as an alternative) with cold water. Shine your torch through the water until it shines a light on your paper. What colour is it? A blue colour? Put a teaspoon of milk into the water. Shine a torch through the liquid. You may have to try shining your torch at different angles. What colour do you have now, orangey red? Add another teaspoon of milk and repeat STEP FOUR. What happened now? The light is redder? If you like you can repeat STEP FIVE and STEP FOUR another 2 or 3 times. Write it up in a science notebook or make it into a report; write or draw your findings. Make charts and tables to record your results. Talk about how we are making this a fair test. Write up instructions so someone else you know can try it. It's all about light splitting like when we see a rainbow in the sky, but the milk molecules scatters the light in different directions so instead we see a red light. This is the same reason that we see red at night in the sky: as the sun lowers the angle of light changes and the sky turns red. You should find that the more milk you add the redder the light becomes. In this experiment, the torch represents the sun. The light from the torch is a combination of all wavelengths of the visible spectrum, the colours of the rainbow: red, orange, yellow, green, blue, indigo, and violet. Blue has the highest frequency (shortest wavelength) and red has the lowest frequency (longer wavelength). When you added milk to the water, you added many tiny particles to the water. Milk contains many tiny particles of protein and fat suspended in water. As you shine the torch through the milky water, the light collides with and bounces off of the many molecules from the milk (the protein and fat droplets) - this simulates what happens in the air; the molecules simulate the various gases and dust that makes up the atmosphere. These molecules scatter the light, and the light waves with the shortest wavelengths are scattered the most. I recently read that blue light is scattered ten times more than red light in all directions. The red light, having the longer wavelengths continues to travel largely in its original direction. Therefore, the blue sky we see is the result of the scattered blue light waves. It is because the orange and red light is scattered less, more orange and red light travels in a straight line from the torch. When you look directly into the beam of the torch, it looks orange or red. What does this experiment have to do with blue sky and orange sunsets? The light you see when you look at the sky is sunlight that is scattered by particles of dust in the atmosphere. 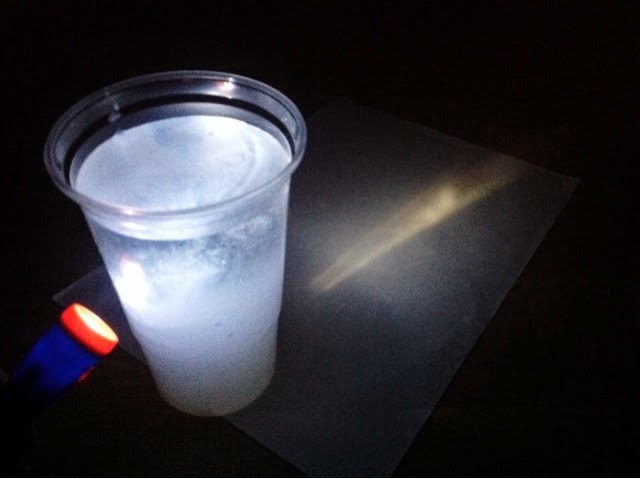 The sunlight is scattered by the dust particles in the same way as the light from the flashlight is scattered by particles in milk in this experiment. Looking at the sky is like looking at the flashlight beam from the side: you're looking at scattered light that is blue. When you look at the setting sun, it's like looking directly into the beam from the torch, so what you are actually looking at is the light that hasn't scattered as far: an orange and red light. Fun! My daughter loves these kind of science experiments. I'll share this with her. Thank you! This is a great experiment and one which we will certainly be trying today. We are currently waiting for our new prism to arrive to explore light in more detail and this is a great idea to link in with our current studies.